In Montana, under the leadership of State Superintendent Denise Juneau, the Office of Public Instruction employs an intensive collaborative approach in two signature initiatives: Montana Schools of Promise, which is improving the state’s most struggling schools, all of which are on Indian reservations; and Graduation Matters Montana (GMM), which is in 58 communities across the state and is resulting in record-breaking high school graduation rates. In both initiatives, meaningful engagement of key stakeholders is central to the strategy and is seen as critical to the success of the work. The Education Commission of the States report suggests six questions for states to consider. What follows is a consideration of these questions through the lens of Montana’s initiatives to illustrate concrete examples of an SEA’s approach to stakeholder engagement. When we launched Schools of Promise, we knew there were years of distrust between the schools, the SEA and the community. The complexities of the challenges – from generational poverty to rural isolation and an education history pockmarked with cultural oppression – meant people had to come together differently if we were to try something new. In order to signal a new way of doing things, Superintendent Juneau and key staff traveled to each community to meet with teachers, students, elected officials, tribal leaders and program directors. At each meeting, we asked two open-ended questions: “What are your best hopes for the schools in your community?” and “How can kids’ lives be improved by schools, community and families working together?” We culminated each visit with a community dinner, in which participant responses throughout the day were written on flip charts. We then asked community members to discuss the questions with one another. This way of launching Schools of Promise accomplished three things: it signaled to the community that the SEA was not there to solve all their problems; it gave community members, students and school staff an opportunity to begin to define a common vision; and it began to build a little trust all around. The hard work of co-creating plans and budgets to implement change soon followed, full of compromise and negotiation, but the way we started the process through prioritizing trust and developing shared vision was crucial groundwork. #2: Whose work is it? SEAs should invite stakeholders who share responsibility for the current situation and can be a part of the solution. I liken the importance of inviting in stakeholders to the tale of the blind men, who come upon an elephant and argue over what they have found. “It’s wide and soft and floppy!” says the man touching the elephant’s ear. “No, no! It is hard and sharp and cool,” says the man behind a tusk. They are both right, but yet, they are incomplete in their understanding of the beast. In GMM, none of us – school administrators, students, community members, certainly not government officials – can fully understand the challenges of students not thriving in school. It is only through bringing together people with differing perspectives and experiences that we begin to understand more fully our opportunities for change. #3: Who has the expertise to provide the information needed to make good decisions? SEAs should seek out experts to help stakeholders gain a deeper understanding of complex issues. The report advises that experts inform the process, not drive it. I am particularly fond of this question. As I recently wrote, I attended a day-long meeting in Washington, D.C., this spring that consisted of every-hour-on-the-hour “sit and gits” – expert panelists presenting data and research related to drop out prevention. I kept waiting for the point in the day when participants would be introduced to one another, or invited to talk in small groups about what we were hearing and how it connects – or doesn’t connect – to our own experiences. Unfortunately, that did not happen. Too often, efforts to convene stakeholders are overrun with “content experts” when what is needed is more “context experts” – the people who have either lived experience and/or a depth of understanding about what works and what doesn’t work in their community, or with their constituency. Serving as context experts is a key role for stakeholders, who can then inform the vision and priorities within state education plans. #4: Who has the credibility to bring stakeholders together? Find partners with the credibility and influence to bring a diverse group of stakeholders together. In Schools of Promise, one key constituency for change is teachers, who are asked to make big adjustments to their practices – from extended school calendars to intensive professional development. 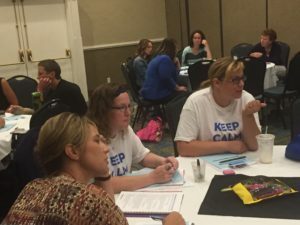 Prior to the launch of the initiative, the Office of Public Instruction officials met extensively with the Montana teacher’s union to develop a shared understanding and commitment to Schools of Promise. When we traveled to local communities, a representative from the union often accompanied us, and when negotiations for the work commenced, the union was a critical partner. In GMM, the private sector is a major partner, and has contributed more than $1.3 million to support the initiative. Their funds – which are routed directly to local GMM communities – signals to local leaders and main street businesses that this work matters, which has led to more than 450 new business and community partnerships across the state. #5: How do stakeholders work together? Create a credible, open process that allows stakeholders to learn together, diagnose the situation, explore alternatives, develop strategies and put them into action. Time is a precious resource, and so we need smart, efficient processes for how we bring people together and what we do once we are all in the same room (or conference call). GMM provides a framework for communities to develop local plans to combat high school dropout. The first step in the GMM framework is to bring together a team of people – students, school staff, community organizations and main street businesses. The team then looks at data – qualitative and quantitative – to better understand the specific strengths and challenges of youth in their community who struggle to stay in school. 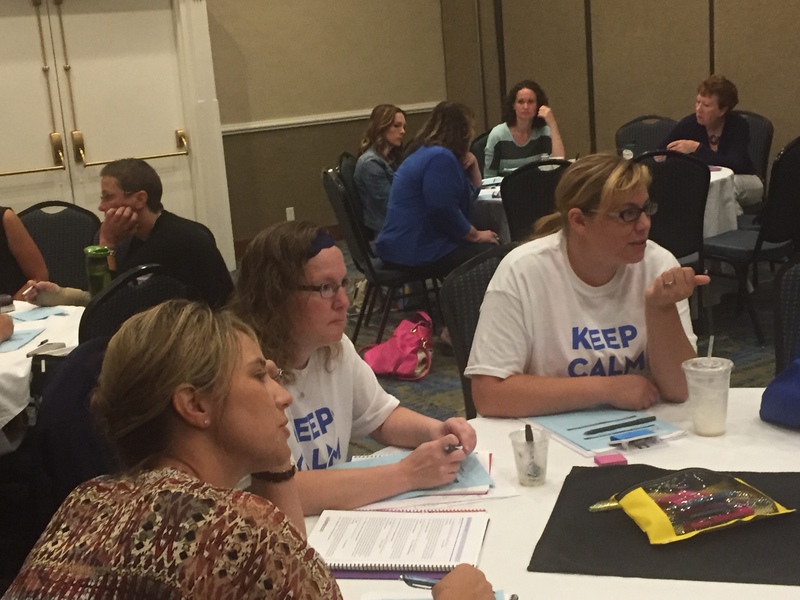 The third step is to reflect on effective practicesalready in place in the school and community, as well as in like-sized communities in the state. Lastly, local GMM teams engage in ongoing, proactive communication with the media, community and families. #6: Who will energize and sustain the work? Search out stakeholders who are willing and able to provide strong process leadership to sustain the collaborative work. Sustaining the momentum of any complex endeavor requires three critical elements: a compelling reason to do the hard work; a central body to design communication and engagement strategies; and the commitment of multiple stakeholders to rally their constituency through continuous communication. In each initiative, the SEA serves as a central body that develops core communication messages and designs stakeholder gatherings that emphasize interaction and relationships. The SEA also fosters trusting relationships with key stakeholders: in Schools of Promise, the SEA works directly with students to develop youth leaders who support the hard work of school improvement; in GMM, the SEA works with United Way affiliates to support local GMM teams. Bringing these kinds of practices to bear in the development of ESSA stakeholder engagement is made easier through Collaborative Stakeholder Engagement. In addition, the Council of Chief State School Officers has published a helpful guide with terrific planning tools that an SEA can use to design their ESSA stakeholder engagement. Deborah Halliday serves as senior policy advisor to State Superintendent Denise Juneau at the Montana Office of Public Instruction, where she helped to launch Graduation Matters Montana and Montana Schools of Promise, which works with the state’s most struggling schools on Indian reservations. She can be reached at dhalliday@mt.gov.